Looking for a Retail Space in Ellisville? West 100 Plaza in Ellisville, MO is now available for Lease! West 100 Plaza features 16,990 square feet of space and was built in 1989. The property is ideally situated on Manchester Road with approximately 35,000 Vehicles per day. There is a 52 car parking lot and monument signage available for all Tenants. Existing Tenants include: H&R Block, Herbs & More, Travel Tyme, West 100 Cleaners and Flamingo Salon. Currently available are two suites: The first of which is 1,375 S.F. and was formerly occupied by a Pizza Restaurant which has duct work vented through the roof for a hood system. The other suite available is approximately 4,100 Square Feet and was formerly occupied by a fitness facility. The majority of the space is wide-open with the exception of 4 private rooms. In addition, there are 2 office/storage suites available for Lease on the lower-level for $10/SF Gross. Located in Ellisville, MO on Manchester Road East of I-109 and just west of Kiefer Creek Road. For additional information, or to set up an appointment, please contact Mr. Ben Cherry at 314.647.6611. Our Very Own, Ben Cherry, published! 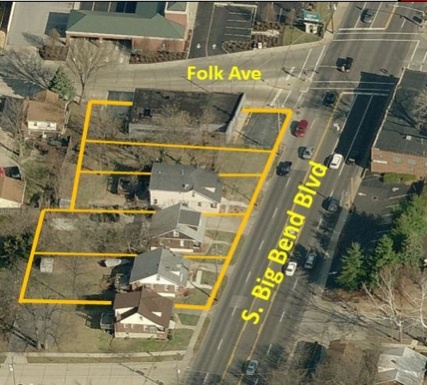 A development with a “restaurant component” is in the works for five parcels on the southwest corner of Big Bend and Folk Avenue, according to Ben Cherry, of Manor Real Estate. Cherry said the developer is going through its due diligence, which could take 90 to 150 days, so its too early to add details. The properties went on the market in July. Click here to view the story in 40 South News. After a couple of months of planning, we are delighted to announce the launch of our new website. We wanted a new website to better collaborate with our clients and associates on that which we are most passionate about Real Estate.